Down jackets are known for their warmth, but there’s a common understanding that water is their Kryptonite. Here in the Northwest, where “liquid sunshine” is a familiar euphemism, waterproofing is just as important as warmth when you’re outdoors. That’s especially true for winter adventures, where the moisture can come as much from snow as it can from sleet and freezing rain. But if water is down’s Kryptonite, then the Outdoor Research Floodlight jacket is Superman 2.0, because it certainly doesn’t have that weakness. 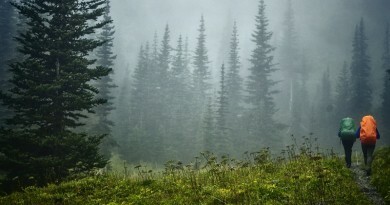 Outdoor Research is based in Seattle, so the company knows a thing or two about needing to stay dry. 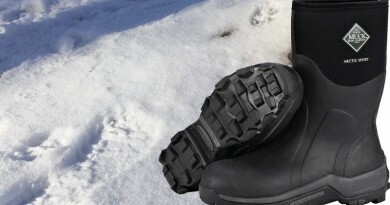 I noted as much in my review of their Mute Sensor gloves, which strike a great balance of warmth and waterproofing. But gloves are small and just need to keep a small area warm, and they can be tucked away from moisture. A jacket covers your entire torso, meaning it’s not only much more exposed to the elements but needs to keep a wider area toasty. The Outdoor Research Floodlight jacket excels in both areas. On the warmth front, the jacket has 800 down insulation in its body, arms and even the hood. Having it in the hood is a particularly nice feature, as it really insulates your head from driving winds. That’s not to say you notice the wind in the torso area. 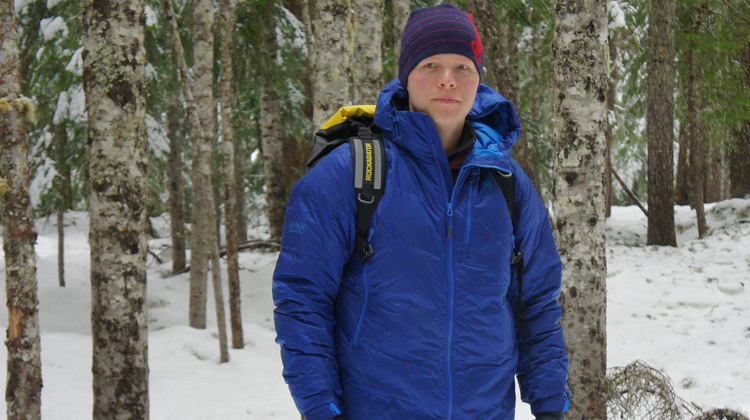 The Floodlight jacket also windproof, a fact I can vouch for based on my experiences both snowshoeing on Mt. Hood and hiking through less-alpine areas closer to the city in windy conditions. Even as 25mph gusts caused my body to tilt or sway, they never caused me to feel a chill. Having such insulation would’ve been for naught had the Outdoor Research Floodlight jacket let me get wet. And since it’s down, I sincerely had that concern no matter what the marketing literature said. I was relieved to find the Pertex Shield+ coating holds up like a champ in most conditions. Up in the mountains snow cascaded right off, and occasional sleet and even drizzles farther down beaded-up like water on oil. Even hiking at lower elevations in the rain saw the water bead-up and fall off. During a few heavier showers the exterior didn’t bead-up quite as well, but it was probably due more to the deluge than to any fault in the Pertex Shield+ fabric. Honestly, even my eVent-coated rain jacket has failed in a few similar downpours, so I won’t hold anything against the Floodlight specifically. However, I did find that anytime I wore a backpack in a moist setting, the water “ground into” the shell at any location where the straps made contact with the jacket. Seeing the shell change color and appear “soaked through” in those areas caused a few moments of panic, but I always stayed dry and no moisture made it into the jacket itself. The fully taped seams certainly helped in this regard too. Still, I’d recommend some caution if you want to wear any gear with this jacket, just to be safe. I only stayed out three hours each time wearing gear with this jacket, so it was unclear to me whether that grinding-in of water might lead to failure after a longer period of time. The men’s Floodlight weighs just 21.2 ounces, and the women’s version is even lighter at 18.1 ounces. In spite of that weight, the jacket has some some impressive creature comforts that go above and beyond what I’ve seen in a few other jackets, including extra pockets and lots of adjustable elements. Two specific comforts that deserve mention are the wire-brimmed hood and adjustable gauntlets. The wire-brimmed hood adds some forehead protection from the elements, and it gives the moisture a surface to drip off of that’s farther away from your face to help keep your nose dry. The adjustable gauntlets, meanwhile, add to the overall sleeve length and can go over the end of your gloves, which adds some insulation to your wrist area. This feature isn’t present in Stio’s Hometown Down Hooded Jacket (review coming soon), and I missed it dearly. Throughout my time reviewing the Outdoor Research Floodlight jacket, the only hiccup I encountered was the width of the baffles. Outdoor Research heat-sealed the baffles to keep the down from all falling to the bottom, and I can say it does a great job at that. However, the baffles are so wide that the down has enough wiggle room to move around horizontally where the backpack continually presses against the jacket. Fortunately this deformation isn’t permanent, as the down can always be adjusted back into place. What is permanent is my overall positive impression. 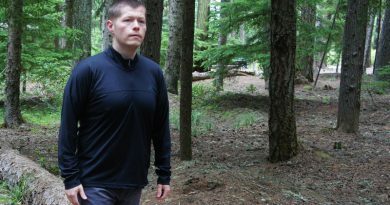 From the mountains to the foothills to downtown Portland, the Outdoor Research Floodlight jacket kept me warm and dry regardless of my activity. It’s not a jacket you’ll wear when the temperature goes above 50 degrees, but it’s one to keep handy when the mercury drops low, and it’s not a down jacket you’ll need to avoid if the elements turn against you. 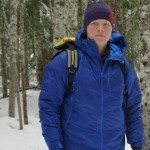 The Outdoor Research Floodlight jacket was provided for review. All opinions and words are my own and honest, and the article contains no affiliate links.